This 8th grade Drama class focuses on basic acting skills (using your voice and your body to effectively communicate a character’s thoughts and emotions), developing creativity and self-confidence, and general knowledge of how a stage production is put together. Units of study include monologues, duet acting, improvisation, and stage make-up. Students must attend a live-theatre production each semester and write a review of the performance. The 9th grade Drama focuses on basic acting skills (using your voice and your body to effectively communicate a character’s thoughts and emotions), developing creativity and self-confidence, and general knowledge of how a stage production is put together. 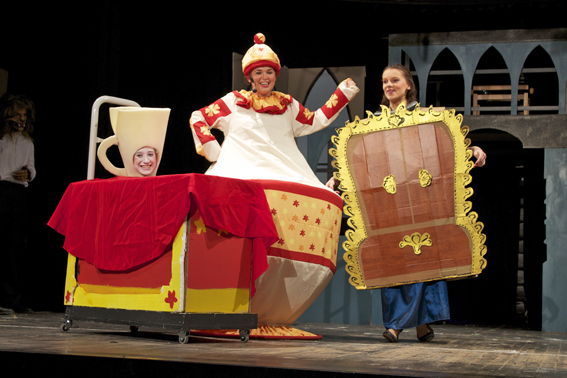 Units of study include improvisation, duet acting, oral interpretation and storytelling, costuming, and stage combat. Students must attend a live-theatre production each semester and write a review of the performance. The 10th grade Drama focuses more intensively on acting skills and character development. Units of study include improvisation, duet acting, monologues, and stage lighting. Students must attend a live-theatre production each semester and write a review of the performance. This class is offered for 11th and 12th Graders and counts as an elective for the diploma program and as a GK class for the Abitur. Students may take this class for both 11th and 12th grade years. The course follows the Berlin Rahmenplan for Darstellendes Spiel and focuses on both theoretical and practical aspects of acting. The course focuses on basic acting techniques, rehearsal, and performance. The instructor chooses an area of focus for the class each year and the students create/prepare/rehearse a play that is performed at the end of the spring semester. Working together as a team is an essential part for the success of this course. Students who take this course must be prepared to attend extra rehearsals outside of the scheduled class time. Most of these rehearsals will be on Saturdays or Sundays. In some cases, every student is required to participate in an extra technical rehearsal the Saturday before the week of the performances as well as rehearsals every afternoon the week of the performances. Klausuren/Tests for this course include both performance and written aspects and count 1/3 of the final grade. Active participation in the final performances is part of the Allgemeine Teil (AT) evaluation and can be counted up to 1/3 of the grade for the spring semester. For more information on the JFKS Drama Program please click here for the Fine Arts section.